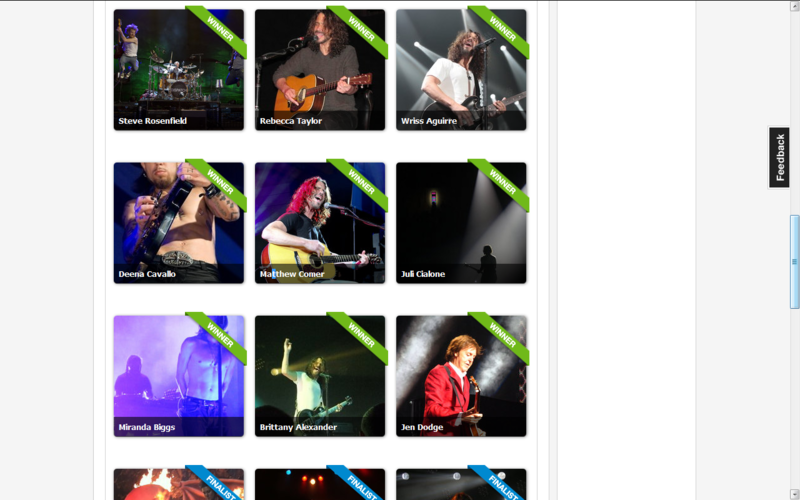 You will receive a photography pass for one date of Chris Cornell’s 2011 tour to photograph Chris live on stage. Your photographs from the concert will be featured in a gallery on Chris Cornell’s social media channels and his official website, ChrisCornell.com. In addition, you will receive a signed set list from the concert that you attend. NOTE: You will be responsible for your own travel and accommodation. 1) You are able to travel to the show at your own cost. 2) You have a suitable camera to take and provide the photos that Chris Cornell will feature on his website and social media channels. 3) Your contact phone number (cell phone is preferable). 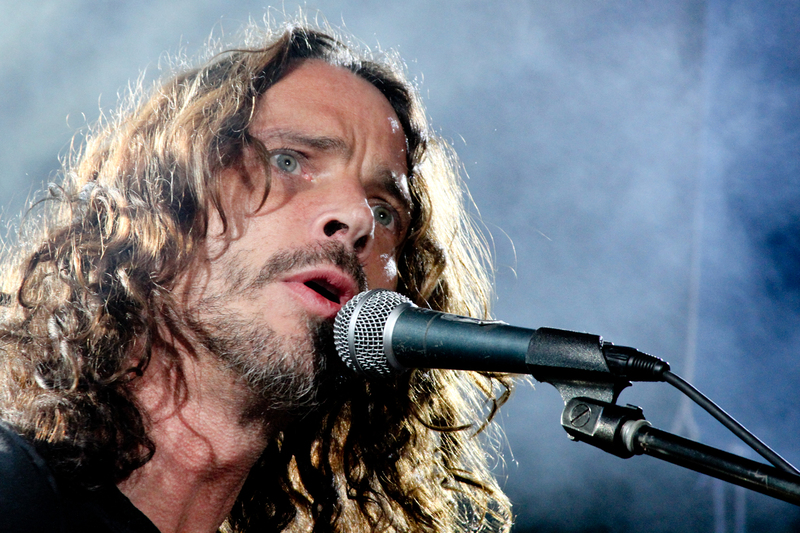 4) The city in which you live, so we can send your details to Chris Cornell’s representatives. TalentHouse Contest for Photograph Chris Cornell a chance to win passes and setlist to Chris Cornell live acoustic, Nov 26 – Atlantic City, NJ – Borgata Hotel Casino & Spa. This photo was taken during the first days of SXSW my hometown of Austin, Texas. I was sitting in a movie theater about to watch the premier of a new film when a friend called and told me that Chris Cornell was playing an acoustic show down the street at The Belmont. Of course, I quickly left and headed straight for the show. We got in line and quickly made it up front to see Chris Cornell play live in all his glory. I snapped a few photos, here is one of the better ones. I am so excited about winning this contest!! So so excited and really couldn’t believe it when reading this email and online announcement. 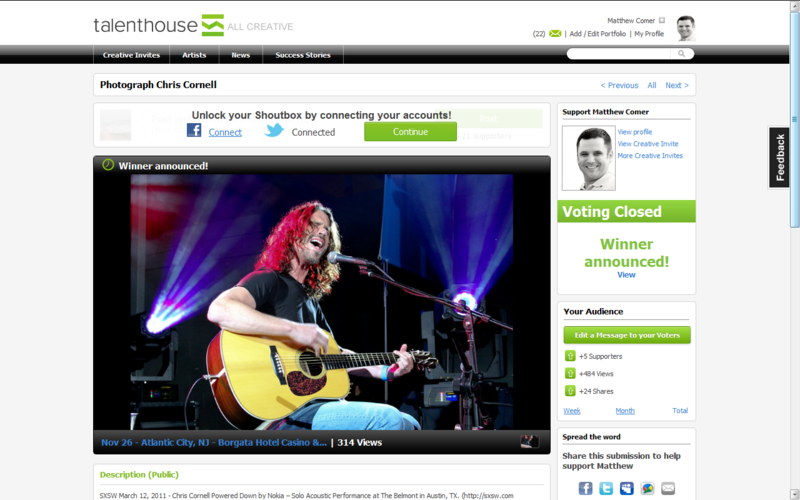 As excited, overwhelmed, appreciative, and honored I am for wining this contest to the Chris Cornell show Atlantic City, New Jersey on Saturday, November 26th; unfortunately I will be unable to represent TalentHouse and Such Good Photography at this event. Shortly after my submission, I was informed by my employer of over 8 years that due to cost cutting measures I would be required to take off 5 mandatory unpaid days off between now and Dec 3. This combined with 2 unpaid holiday days off for Thanksgiving would put my family into a bind by additionally taking care of my own travel and accommodations from Austin to New Jersey. Hopefully, the runner up will be as excited as me to have been bestowed this honor and would be more easily able attend the show and document this show with beautiful photography of the talented Chris Cornell. I hope that this can happen so that somebody else may enjoy this incredible opportunity. Read the account of the winner of the contest and see her wonderful photos and more about the photographer.